Nonjatta: A new Karuizawa... and already gone! A new Karuizawa... and already gone! Post by Stefan of Tokyo Whisky Hub. These days, if you even so much as blink, chances are you will have missed a new Karuizawa bottling. Liquors Hasegawa doesn't often release store-exclusive bottlings, but so-called "point members" will have noticed on the postcard they got yesterday that a new Karuizawa was going to be released, exclusively available from them. No indication when. But past experience (read: "having missed out once too often") taught me to keep my eyes peeled, and sure enough, today it was up on their website. 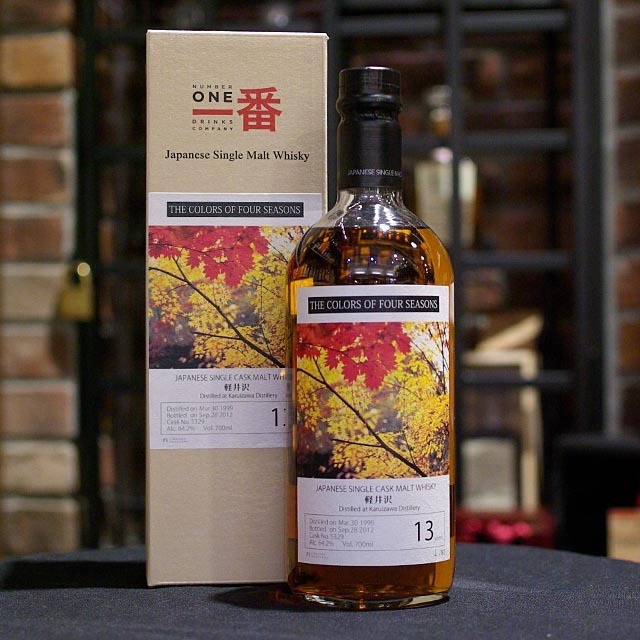 A beautiful label sporting the Karuizawa surroundings in the fall and in the bottle: the contents of a 13-year old single cask, distilled on 30 March 1999 and bottled on 28 September 2012, drawn from cask number 5329, and brought to you at a whopping 64.2% abv. The outturn - and here you'll start to get the gist of the title of this post - a mere 82 bottles. The good news: it was the most reasonably priced Karuizawa in recent years (at 8,980 yen). The bad news: they're all gone... sold out in less than a day. If you missed out on this one, well... a little bird told me a new Karuizawa for the Japanese market will be released tomorrow or the day after. If that isn't a red-hot tip, I don't know what is!